Please Like Me is an Australian sitcom from comedian Josh Thomas. It airs on the Pivot network, a channel known for its portrayal of post college malaise for “passionate millenials.” The show certainly taps into the Girls (2012) craze for exposition on twenty somethings written by twenty somethings. It’s also really funny, quirky, and all of the other requisite descriptions that advertise this niche. This is definitely problematic when it comes to writing about Please Like Me as it is a show like many others. It has elements of HBO’s Looking (2014) and Comedy Central’s Broad City (2014) and Workaholics (2011), but it also has its own distinctive voice. In show runner Josh Thomas we have an unlikely hero but one that manages to comment aptly on the day to day trials and tribulations of being young. The narrative kicks off on Josh’s birthday. He’s out with his girlfriend eating an “eighteen dollar sundae” when she breaks up with him. She believes that he is gay and Josh pretty much instantly agrees with her. Later he discovers that his mother has tried to kill herself and is now in hospital awaiting treatment. Josh has to move back in with his mother and look after her. This adds another layer to the narrative as Josh effectively becomes the parent (or mediator) to his divorced mum and dad. His mum is very unhappy and depressed and his dad is on the brink of a mid life crisis. It seems though that everyone is experiencing transitions that they find difficult to deal with. That’s the heart of the narrative. Everything changes and you do the best that you can. This setup could be read as depressing (it is) but Please Like Me never dwells in the negatives. Instead we follow Josh from one life altering event to another as he jokes and avoids anything like a healthy dose of reality. He seems to be a person that can just roll with the punches and this is part of the charm of the television series as a whole. Josh isn’t fazed by coming out, he isn’t fazed by losing his girlfriend, instead he seems to be quite self obsessed, but with a self deprecatory tone. At one point he describes himself as having the face of a fifty year old baby. This is a comedic tone we’re all familiar with and there are a great number of television shows with similar premises airing currently. 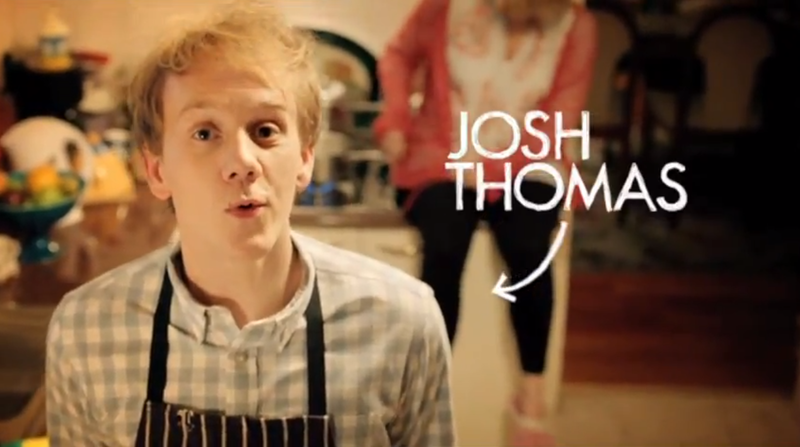 But Please Like Me is something different and that’s mostly down to Josh Thomas. He seems to have a polarising effect with some people loving him and others hating his work. And that’s something else about Please Like Me – you can’t separate the TV show from its creator. They borrow and bleed into each other both subtly and overtly. Josh has a lot to say and often times its pretty stupid. He says what’s on his mind and it lends his perspective and tone of voice to the world that we’re seeing. It’s simple storytelling and the emphasis is on portraying the mundane, showing us our own reality, and then adding a unique tint by showing us it through Josh’s eyes. Perhaps the main fault in Please Like Me is the fact that there is very little depth to the characters and their interactions. This could be simply because it’s written by young writers with perhaps little experience in the areas that they’re writing about. But that’s letting Josh off the hook. He deliberately explores big issues like coming out but there is little realism in the way that he deals with it. It just sort of happens and he accepts it and his family accept it too. For Josh coming out seems very easy and this is certainly a good narrative choice in terms of showing how accepting our perspectives have become (in some cases). However there could have been some more weight to the issues discussed, and just like with Josh’s mums suicide, little seems to affect him emotionally. Of course this isn’t a believable narrative decision and the best comedy successfully blends humour with the tragedies found in life. Josh could do with some more trials, it would be better to see him really struggle and succeed, than to watch him live apathetically. Please Like Me however is a really funny show and it’s one of the more exciting new comedies to emerge in recent years. It’s immediately recognisable as a show about millenials trying to find their feet in a world that doesn’t seem to have space for them. But it also has it’s own unique take on it too. Perhaps the experiences that twenty somethings have can be generalised across international waters. But people are different, they aren’t the same the world over. Please Like Me is a TV comedy series that you may feel you’ve seen before. Josh Thomas on the other hand has a perspective on life that you haven’t. This is good television, humorous but a little light on substance, and it works. Season two has already aired so it could easily accompany season one as a double bill (binge) for the weekend.